This pasta dish can’t get any better can it? 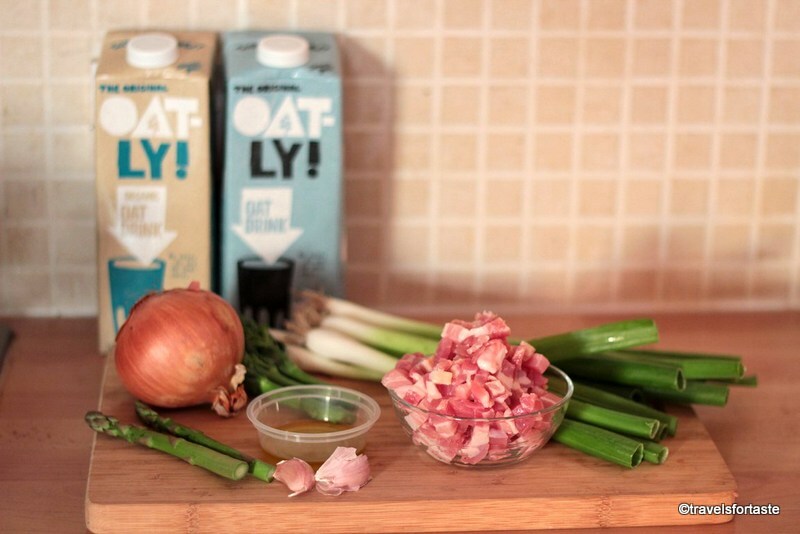 Ok wait till you hear what OatLy Creamy Oat is all about…It’s made in Sweden using entirely organic ingredients. The fat content is absurdly low 3% over 9.6% in regular cream.Besides it tastes like cream made from cow’s milk and is packed with fibers. 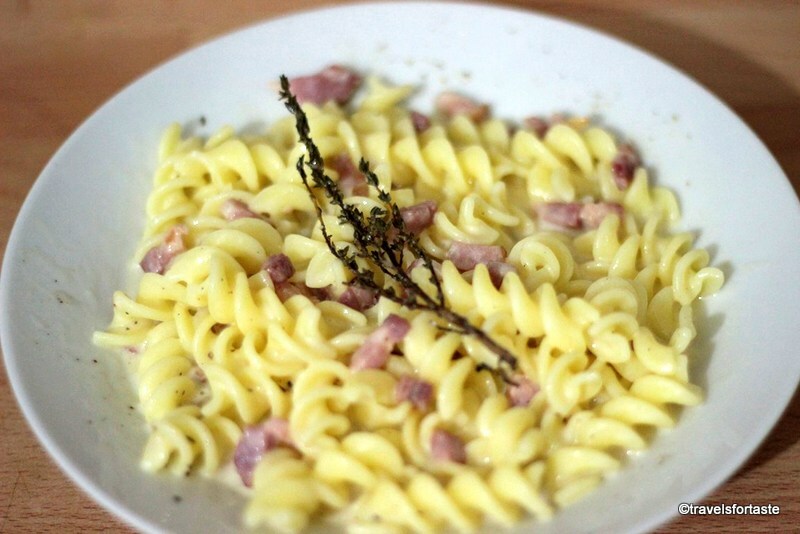 Boil the pasta in a saucepan with some rapeseed oil and allow it to cook completely.Sprinkle some sea salt into the water while it is boiling. While the pasta is boiling get started with preparing the sauce. Chop the spring onion into bite size pieces. In another saucepan add 1 tbsp olive oil and place on a medium heat ,when the oil is hot ,crush the garlic with the skin on and add into the hot oil. Allow the garlic to brown and then add the spring onion, when the onion begins to change colour add the bacon pieces and reduce the flame. Let the bacon cook for about 5 minutes till it turns crisp and yummy while stirring occasionally till ensuring it doesn’t get burnt. 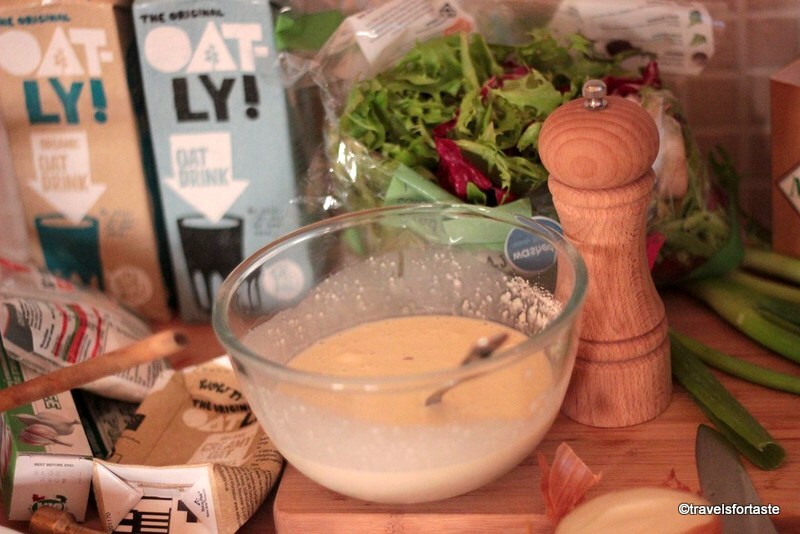 Reduce the flame and then pour the Oatly oat cream into the bacon mixture and add a sprig each of thyme and rosemary. Cover the sauce pan and allow to cook for about 2 – 3 minutes. Add freshly crushed black pepper and sea salt to taste and some chilli flakes. 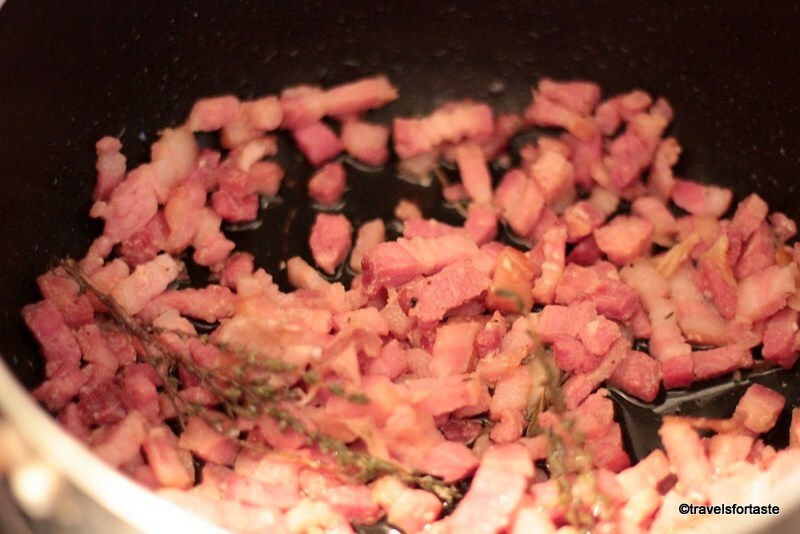 In a plate add the cooked pasta after draining excess water and pour the bacon and cream mixture over the top. Chop the tender stem purple asparagus roughly into bite size pieces keeping the spear head intact , do the same with tender stem purple broccoli. I loved the colour so I picked purple, its absolutely fine to go with the regular green stuff but the colours in this finished salad are so vibrant! Set aside and move onto the mushrooms and onion now. In a saucepan heat the olive oil. Saute the garlic with skin on in the hot oil and when it turns brown add the mushrooms in .Let them cook for about 1/2 a minute. 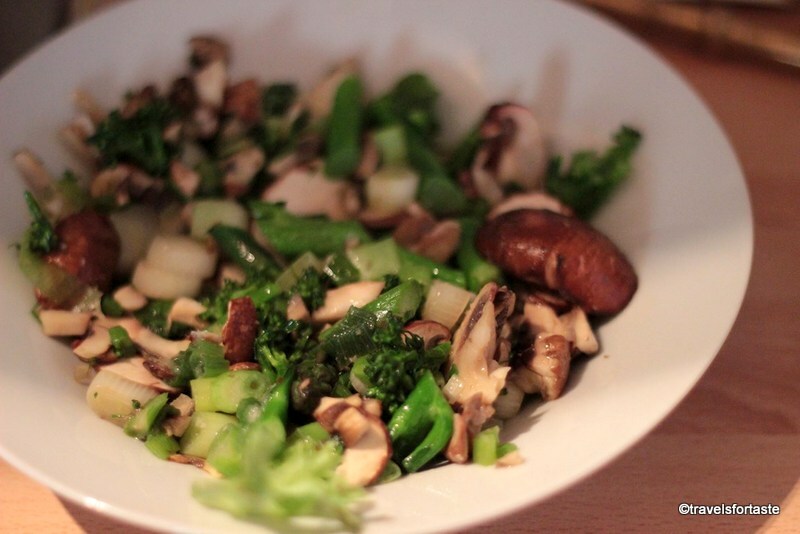 Add the onion,asparagus and broccoli into the saucepan and stir for about 1 minute on a low flame we don’t want the greens and the onion to cook and loose the crunch and bite , just give them a bit of flavour so they sit well with the leaves. Take the saucepan off the bowl and allow to cool. In a salad bowl was and add the salad leaves , give them a good slosh of cranberry vinegar,sea salt and cracked black pepper and give them a good ol’ shake so that the vinegar coats the leaves well. Place the green and onion over the salad leaves and throw in some juicy red cherry tomatoes on a vine or salad tomatoes into the salad. 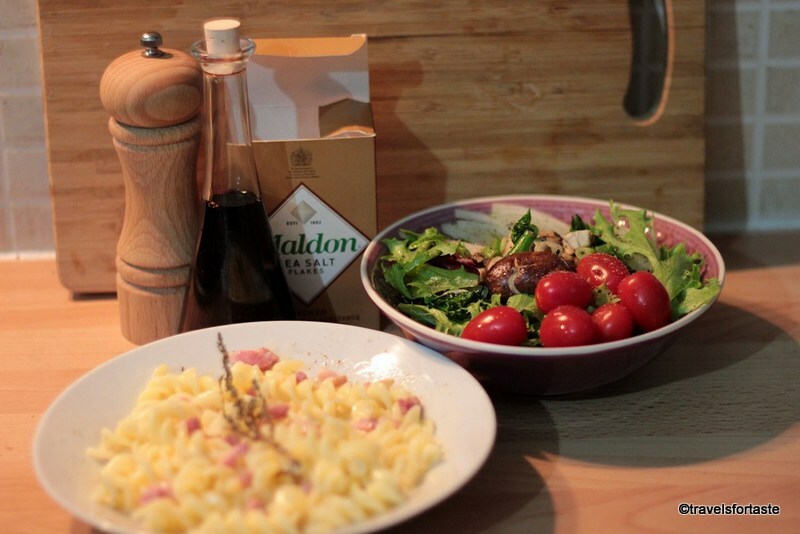 Give another sprinkling of Maldon sea salt and freshly cracked black pepper. 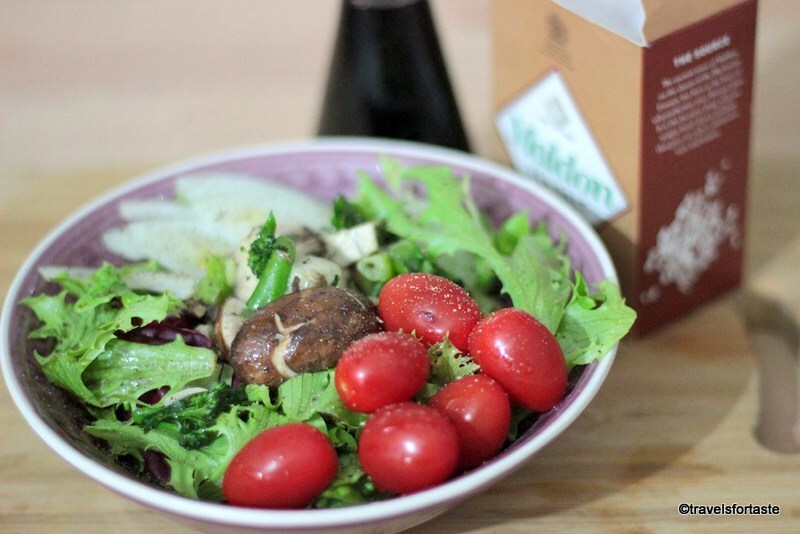 If you want to bulk up this salad add 2 boiled eggs halved on top and serve with a cheesy bread or focaccia as a side with a creamy mushroom or chicken soup for a wholesome but light and healthy meal option! 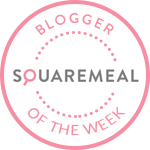 Keep the bukled up version of this salad vegan , again by replacing boiled eggs with fresh large chunks of tofu. I am quite happy with the end result of this pasta and have another 250 ml tetra pack of Otaly CReamy Oat to experiment …wonder what will come out of that lovely little pack , now where is my thinking cap ?! 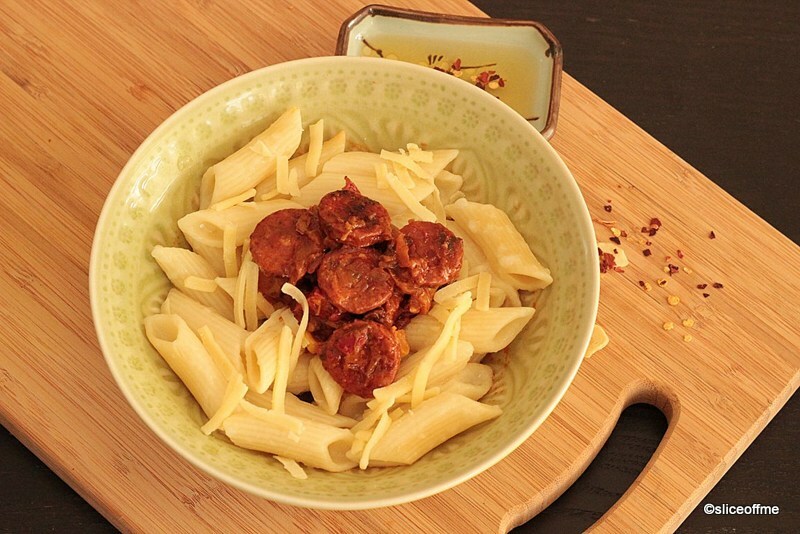 Spicy Chorizo Pasta with loads of veggie goodness! Now add the chopped button mushrooms and the sweet corn and red pepper mixture. 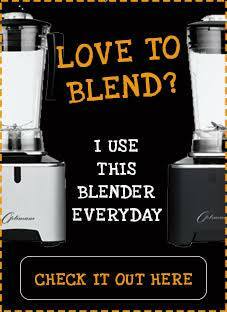 Add the cream and cook on a low flame for 2 – 3 minutes,season with salt and then add generous amounts of cheese. Before starting on the spicy sauce boil the past in a large saucepan and add sea salt and olive a generous splash I use flavoured oil – the bottle had a large sprig of rosemary some crushed garlic and chilli flakes tossed inside to give it a deep rich flavour- so , so good! In a saucepan heat half a tablespoon of oil and fry the red onion chopped lengthwise and 2 garlic cloves finely chopped. Then add the bite sized pieces of Chorizo and reduce the flame to low. Let the chorizo almost start to get crispy and then added the pureed tomatoes,dried herb mixture,chilli flakes and salt as per taste. In a clean bowl add a generous portion of the creamy sauce, top it with cooked pasta and then add the spicy chorizo sauce.Sprinkle with as much cheese as you want and watch it melt into the steaming hot pasta.If you want just a bit of guilty pleasure drizzle some chilli olive oil on the pasta before mixing the whole thing together!